Nifty faces a resistance at 5730 during the trade today. After a good rally during the last two days which has added around 200 points to Nifty seems fizzling today. After a small gap up at 5780.65, we had also given a sell call in Nifty at 5720 with a target of 5680. Immediate after our call the Nifty slide and touched a low of 5669 which was much lower to our expectation, which again shows a weakness in the market. We had given the call around 12:50. After making a low, Nifty showed a recovery and managed to go up to 5725 again but again fell to close flat at 5688.70. Sensex also closed in red. Today Midcap stocks showed some buying and Midcap closed in green. In view of the chart analysis, it can be said that tomorrow Nifty can slide further and find a new base where from it can bounce back. We had already made a strong support of 5500. But this is too deep. So if Nifty wants to go further up, it has to make another base which should be any levels around to 5600 or 5650. Traders are advised not to take any long positions in any stock till Nifty gives another sign of going up. This is advised because the global markets are now coming to correction and many hedge funds in US and Europe had suffered heavy losses in Gold bets! The effect of Gold turmoil can be seen in the next few trading sessions and how serious is the effect, no body can say except the time! Tomorrow's strategy should be to avoid long positions in Nifty. Short Nifty if it trades below 5670 with a target of 5610 which is the support in our view. As per the data sheets, today is a long list of stocks where long unwinding has taken place. Nifty opened at 5859.50 a gap up of 24.70 points on 19.03.2013. Nifty opened up as the Asian stocks were trading strong in early trade. Also market was expecting a rate cut from RBI policy to be announced later in the day. But soon after the opening a selling pressure built up in Nifty and it lost the strength and traded almost flat but in green territory. Just after the announcement of RBI rate cut the market has not taken the Repo cut in positive. The market also wished for a CRR cut. So after the rate cut announced the Nifty dipped and traded around 10 points down. But suddenly at around 11.30 a news flashed that the DMK had pulled out support from UPA Government. It sparked the political circles as well as market sentiments. Just within minutes of the news flash, the marked dipped to 100 points. The market sensitivity was so weak that even after clarification by Chidambaram that the UPA Government is in majority and there is no fear of minority and stability to the Government, the market has not reacted and ended in red at 5745.95, a down by 89.30 points. 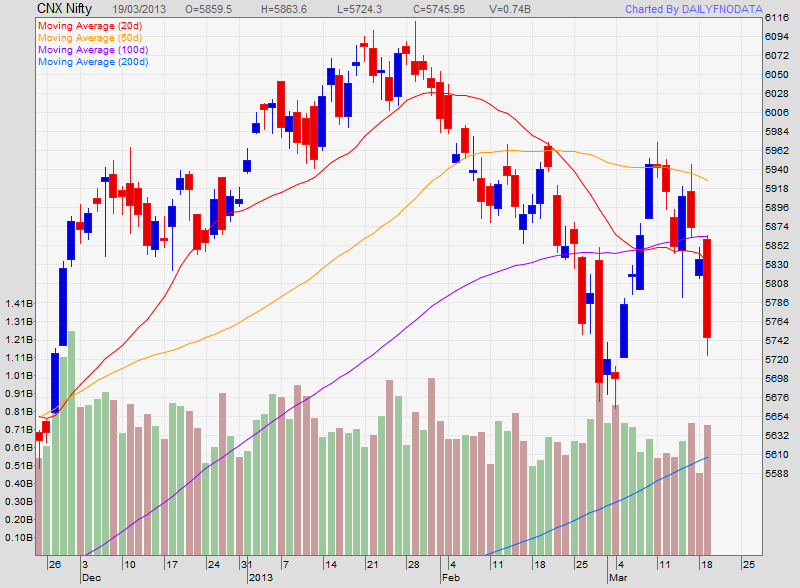 Nifty has broken a strong support of 5800. Not only this the Nifty has also broken a good support of 5765 and closed below these levels. A further downside cannot be ruled out as the Nifty closing is approaching next week. However the market has resistance of 5780, 5800, 5825 and support at 5730, 5700, 5680. The traders should be cautious as the Nifty has broken the strong support. Only after a recovery is seen, one should enter into the market. Nifty opened at 5816.75 a gap down of 55.85 points on 18.03.2013. Nifty was down because of global cues were weak on account of Cyprus levied the bank deposit tax and a possibility of bailout in Cyprus. The world markets were feared about the European concerns. All the Asian indices were down from 1.5 to 2.25%. Nifty made a low of 5814.35 just after opening. After that the Nifty managed to trade in a very narrow range of 5820 to 5840. However after 2PM some short covering came in and Nifty managed to cross the barrier of 5840 and touched a high of 5850.20. However, before closing Nifty again softened due to the fear situation of investors and profit booking in the counters showing some gains in today's trade. Nifty closed at 5835.25. As per our analysis the Nifty has down around 136 points from the intermediate high of 5971.20. The main resistance of Nifty will be 5850, 5910, 5935 before breaking the 5970 mark. 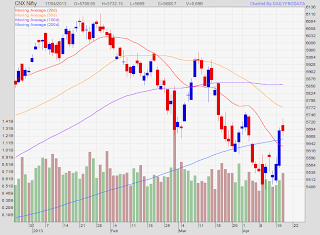 However in our opinion the Nifty has a strong support at 5800 and 5765. In our view, one can go long keeping in view these levels.